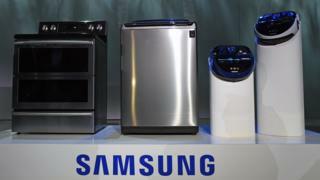 Samsung has confirmed it is in talks with US consumer watchdogs after a lawsuit against the firm over "exploding" washing machines. The Consumer Product Safety Commission (CPSC) warned of problems with some of Samsung's top-load machines. It comes as a US law firm filed a suit against the South Korean firm, saying the fault can lead to injury or damage. Models sold outside North America are not affected by this issue, a spokesperson said. The problems follow Samsung's global recall of its Note 7 smartphone over "exploding" batteries. Both Samsung and the CPSC said that certain top-loading washing machines from March 2011 to April 2016 were affected. "In rare cases, affected units may experience abnormal vibrations that could pose a risk of personal injury or property damage when washing bedding, bulky or water-resistant items," Samsung said. The company advises consumers with affected models to use the lower-speed delicate cycle when washing those materials. Samsung does not name the models, but allows customers to enter the serial number to see whether their machine is among those affected. The firm also faces a suit from a US law firm which alleges that some of its "top-loading washing machines explode in owners' homes," leading to potential injury or damage, according to attorney Jason Lichtman. "Users have reported Samsung top-load washers exploding as early as the day of installation, while other owners have seen their machines explode months or even more than a year after purchase," the firm said in a statement. The faulty washing machines come right as Samsung is in the midst of a global recall of its flagship smartphone Galaxy Note 7. The company was forced to urge 2.5 million phones to be returned because of faulty batteries causing some phones to catch fire and users reporting "exploding devices". Samsung said on Thursday it would start selling new Galaxy Note 7 smartphones in South Korea this week. The revamped smartphone will start being sold in other markets, including some European countries, on 28 October. A Samsung spokeswoman said: "We would like to reassure everyone that new Note 7 phones are operating properly and pose no safety concerns." Hanjin bankruptcy: Are South Korea's 'chaebols' in crisis?